At first I didn’t know how to respond. One would assume that selling the first generation iPad on eBay or Craigslist would be difficult because potential buyers would prefer the new and improved model. screenshot via ebay.comFirst generation iPads are selling quickly on eBay and other reselling sites. Apple is also offering the first generation iPad at a discount; the lowest priced model is selling for $399 on a special clearance Web site. On a number of shopping Web sites, people are clamoring to buy the first generation iPad, and in the process, breaking resale records for electronics. Annie Lescroart, a spokeswoman for eBay, said the “Instant Sale” area of the Web site has seen more than “15,931 offers on iPads” since last Wednesday’s iPad 2 announcement. 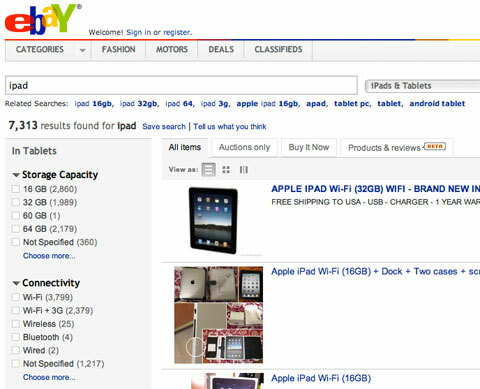 EBay said 1,500 offers have been made for non-Apple tablets in the last six months. EBay’s Instant Sale is a quicker sales platform than the traditional eBay Web site and allows people to sell electronics in a matter of minutes. The base model iPad, which comes with 16 gigabytes of memory and originally sold for $500 from Apple, is selling for $305 on eBay, on average. The high-end model, which comes with 64 gigabytes of memory and a built-in 3G Internet connection, is selling for around $585. Ms. Lescroart said eBay registered thousands of offers on the first generation iPad within the first few hours of the iPad 2 announcement. Kristina Kennedy, a spokesperson for Gazelle.com, which also buys and sells used electronics, said Gazelle purchased more than 2,000 iPads from customers “within the few hours” of the iPad 2 announcement. By Monday morning, the company had purchased or traded more than 7,000 first-generation iPads. “We have paid out well over $2 million for iPads since the announcement of the new model,” Ms. Kennedy said. Gazelle is currently paying between $300 and $500 for the first generation iPad, with prices varying based on memory size and 3G connections. There has been a rise in listings on other Web sites too. There are hundreds of iPads currently listed on Craigslist selling for between $300 and $600. Older PostNote: If you are reading from a line waiting for an iPad 2... you have way too much time on your hands!